Ok, besides the obvious lack of my camera's quality (first picture-my camera; second picture-client's) this cake was really fun to do. The birthday boy (can you say that at fifteen? birthday teen?) 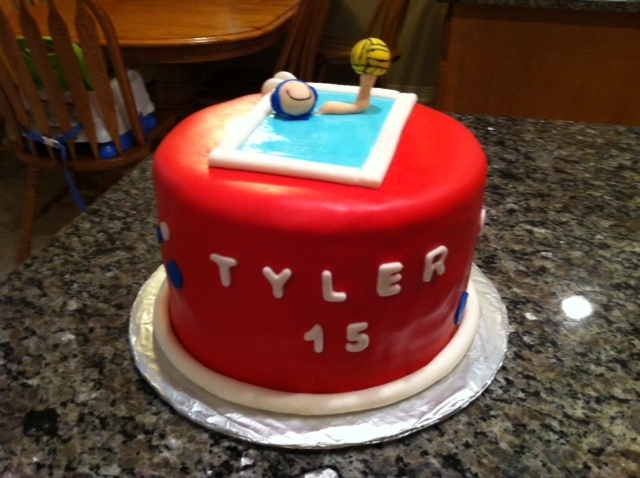 anyway, he is on the water polo and swim team for his school. The school colors are red and blue. Awesome family and it was a privilege to make this for him! Three layer, 8 inch round. Chocolate cake, mint ganache filling and a hint-of-mint chocolate frosting.